The ACOS6 SDK from ACS is a complete software development kit for professional developers wanting to build programs or applications based around the ACOS6 card. 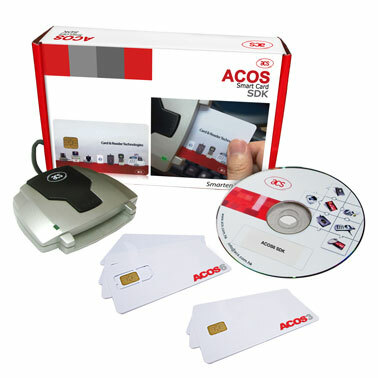 The ACOS6 Multi-application & Purse Card is a high speed and flexible smartcard designed to address the requirements of multiple applications and multiple e-purses with secure and hierarchical access of multiple levels. ACOS6 provides a secure environment for each independent application. This allows many applications to be incorporated onto one card thus providing cost effective solutions to developers, and a convenient platform to end users. Security provided by ACOS6 can further be enhanced by the ACOS6 SAM card which enables mutual authentication, secure messaging and key diversification. The ACOS6 card is ideal for a wide range of applications which require multiple secure e-purses such as government services, payment applications, online top-up, loyalty programs etc. High baud rate switchable from 9600 to 14,400, 28,800, 57,600, 115,200 and 223,200 bps. Full 32K (ACOS6-SAM) or 64K (ACOS6) of EEPROM memory for application data. Mutual authentication with session key generation. Anti-tearing done on file headers and PIN commands. Secure access modules pairs with ACOS2 and ACOS3. Stores and performs all key operations on ACOS2/3 including mutual authentication, encrypted PIN submission, secure messaging and ePurse commands. General purpose microprocessor card with 64k bytes of memory and various security features. Designed for multiple secure e-purses. Cryptographic card designed for secure key storage and mutual authenication. 32K bytes of memory.